Secret Recipe Club is back in business after taking a month off! This time around, I was assigned Deeba’s blog, Passionate About Baking. Deeba has some great recipes, most of which are very sinful desserts…right up my alley! I actually opted for one of the easier ones, and made them this past weekend for my cousin’s Super Bowl party…a HUGE deal in my family since we’re big Giants fans. Needless to say, we’re VERY happy today with our champions! 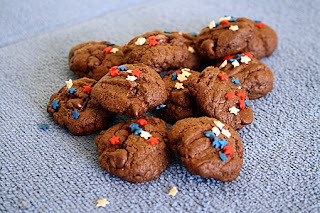 These cookies were not only delicious, but really easy to make. They’re cute little things! I appropriately decorated them with blue, white and red sprinkles…you can use whatever you like. Preheat oven to 350 degrees. Cream butter and sugar together in a mixing bowl. Meanwhile, combine flour, baking soda, coffee, cocoa and salt in a bowl. Add egg to butter mixture and mix, then add vanilla and mix. Slowly add flour mixture in and mix until combined. Stir in chocolate chips. Line baking sheets with parchment paper. Roll dough into 1 inch balls and place on sheets. Press down gently with a fork, then add sprinkles. Bake for approximately 16-18 minutes. Cool on racks. This entry was posted in chocolate, cookies, dessert, QuickAndEasy. Bookmark the permalink. Pretty cookies and mocha too. Yum. What a delicious sounding and looking cookie. Congrats! I’m a pats fan….but I’m glad it was a great game. The cookies look fab. I love that they’re on the puffier side, I hate flat cookies! How cute! I love mocha anything, so they sound great to me! What yummy looking little bites. Cookies look lovely and delicious, I am great fan of Deeba, love her blog to bits.., Good one for SRC.. Thank you for baking one of my fave cookies Melissa. Glad you enjoyed them. Love the ‘sprinkled’ dressing up they got! My blog has since been under a hacker attack…sigh! Still trying to get it back. Yummy! I had Deeba’s blog for my very first SRC club post. LOVE IT. Such a gorgeous place to visit. Congrats on your win! Grumpy was rooting for the Pats so as you can imagine he was Grumpier than normal Sunday night! Well done! These cookies look delicious! The only thing better than chocolate cookies…are chocolate cookies with a mocha twist! Love these! I have little heart sprinkles that will be just great for these for Valentine’s Day! Thanks! Anything mocha and chocolate is wonderful in my book, these sound great! Me LOVE cookies!!! And these look great. Looks super decadent. Nothing like a perfect cookie to make the world a happy place.